A new poster for the 1896 season of Buffalo Bill's Wild West presents a matched pair of men on horseback. To the viewer's left sits Napoleon I, slouched, scowling and defeated, an image apparently modeled on Ernest Meissonier's Napoleon I in 1814. On the right is the young, handsome, virile Buffalo Bill, sitting tall in his saddle and casting his gaze over the prairie. More interesting even than the juxtaposition of these two is the small figure dressed in black, sitting at an easel in the center of the composition, looking at Buffalo Bill. This is Rosa Bonheur, the French artist who had painted a famous equestrian portrait of Cody in 1889. The effect of the triad of these figures is to suggest that, in the eyes of art as well as those of history, Buffalo Bill is the equal of Napoleon. It was dramatic visual copy for advertising the show, but it may have been more than just a commercial. There is good reason to believe that his experience in Europe had raised Cody's estimate of himself. He had not only come to think of himself as a central figure of the pageant of American history, but he had seen firsthand that the title of that poster, "Art Perpetuating Fame," could be true for him as it was for other great figures of history. After returning to America, he spent the last twenty years of his life nurturing painters, fostering relationships with already established artists, and minding the making of his legacy in art as well as in words. The results of the undertaking were mixed, but the process was, as always with Bill Cody, interesting to watch. Since before the Wild West show, Cody intended to travel to Europe to present there his vision of the American West. He probably saw this as an opportunity to enlighten the Old World. In 1887, the Wild West showed in London and around England for fourteen months, returned to America for a short tour, then returned to Europe in the summer of 1889 for the Exposition Universelle in Paris. In Paris, Rosa Bonheur, fascinated with the show, spent many days on the grounds at her easel; she may have been the first painter to have the run of the Wild West grounds. 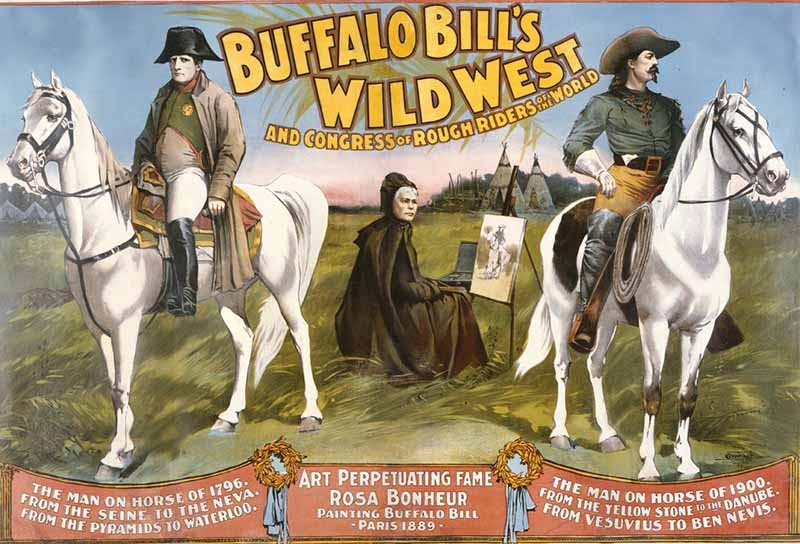 In addition to the portrait of Buffalo Bill, she produced sixteen paintings at the Wild West. Cody himself also appeared to be swept up in the excitement over the artistic exhibits at the Exposition; one newspaper reported that he had been purchasing paintings, and was gaining some reputation as an esthete. Cody began to bring art into his American life in the later 1890s. From 1897 on, he was engaged to some degree with more than a dozen painters. Some, like Charles S. "Mountain Charlie" Stobie and Henry H. Cross, were old friends from a previous life on the prairie. Some were young and unknown, like Robert Farrington Elwell, or slightly older and possessed already of some professional recognition, like Irving R. Bacon or A. D. M. Cooper. Two of them, Frederic Remington and Charles Schreyvogel, contended for supremacy among western painters in the first decade of the twentieth century. Others came and went, showing up at the Wild West or visiting Cody in Wyoming or elsewhere, but these tangential relationships do not define Buffalo Bill's artistic legacy. Cody wanted a variety of things from his painters. In the first place, he hoped to establish some kind of record of his life in Wyoming. His move into the Big Horn Basin, where he set out in 1895 to build an irrigation colony, a set of ranches, and a town to carry his name, led him to see a place where art and artists could fit into his life. Cross, Stobie, and Elwell were the primary documentarians, although a lot of Bacon's production served that function. These men's paintings show Buffalo Bill as a master of his wilderness environment, reaffirming his role as the "white Indian," the man who moved effortlessly between European capitals and Wyoming mountains. Beyond that goal, he wanted high points of his achievements as a scout and Indian fighter immortalized in paint, to establish his life through legacy paintings. Cody in an effort to become a person of artistic discrimination, offered patronage to Elwell, Bacon, Cross, and even Schreyvogel, thus claiming space for himself in the art world. His relationship with Remington was rather too complex to fit these simple categories, but it was clearly very important to him to be known as a friend of the painter. The reverse was also true; Remington took some reflected glory from his friendship with Cody. On the face of it, William Cody's efforts to patronize and sponsor painters after 1895 produced results that included both failure and success. He got a number of paintings out of it, but few of them are of any distinction. His naïve confidence in his own judgment of artistic talent, together with his diminishing financial resources in the last decade of his life, made the project difficult. His invitation for Cross and Stobie to produce profitable paintings yielded little of value, except to Cody himself. His determination to make Elwell into his personal artist showed the immaturity of his judgment and, in the last years, the paucity of his resources. Bacon and Schreyvogel both reinforced Cody's mythical self-presentation and raised the artistic level of his collection. His purchase of A. D. M. Cooper's paintings provided additional depth to his collection, but he apparently made no effort to acquire the work of the most important painter of his generation, Frederic Remington. Ultimately, he could not afford expensive paintings and expensive mines in Arizona. His adventures in patronage hardly offer a resounding example of art perpetuating fame.